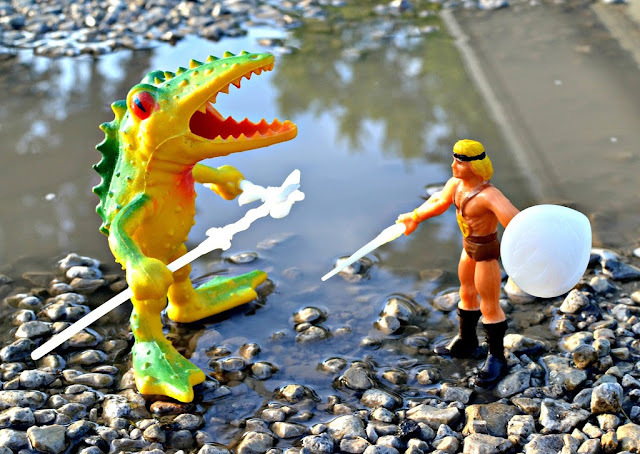 Just another day on planet Glowgon: Heroic warrior Ronin takes on Froggacuda, Monster of the Red Lake! As you might have already gathered, I tend to have a weakness for cheap-looking toys. Especially ones that involve any combination of monsters, fantasy and the 1980s. Crappy paint jobs? No problem. Bizarro, sort-of-unfinished-looking sculpts? Cool with me. That's probably why I love The Other World--an early 1980s budget toy answer to Masters of the Universe--so much. 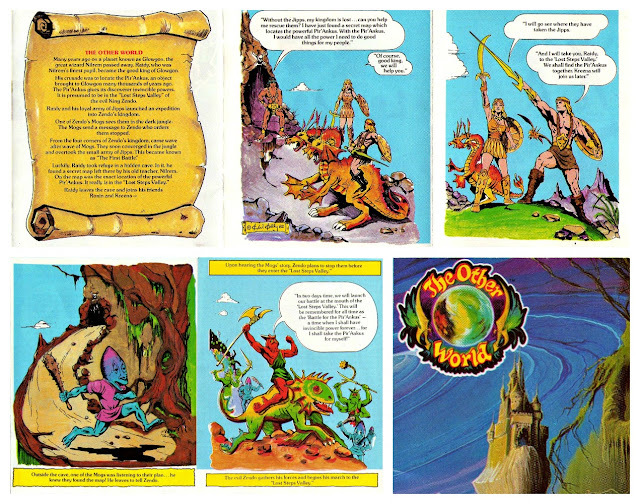 This line featured a host of fantasy warriors and strange creatures, and was released by Arco as part of the '80s fantasy craze. Whatever the line might have lacked in production quality, it made up for tenfold in pure charm. First, let's cover the basics. The Other World premiered in 1982 and included a couple different kinds of figures: standard bendable heroes and villains around 4 inches tall, and larger monsters. 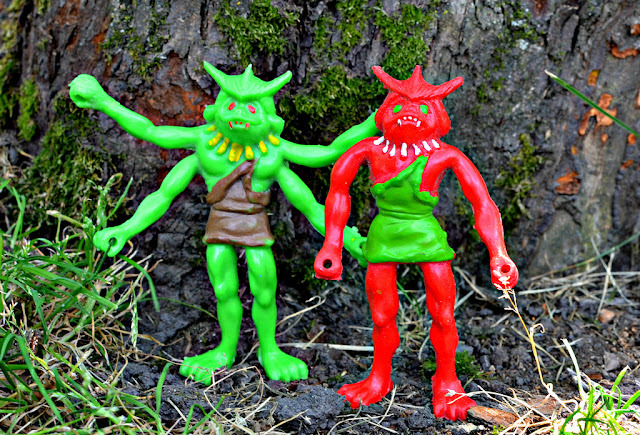 Most of the figures came with glow in the dark weapons and smaller companion creatures (Jipps and Mogs). There was also a playset available called "Castle Zendo," which consisted of a plastic castle front and a thin plastic mat depicting the terrain of planet Glowgon, the setting of the line's story. 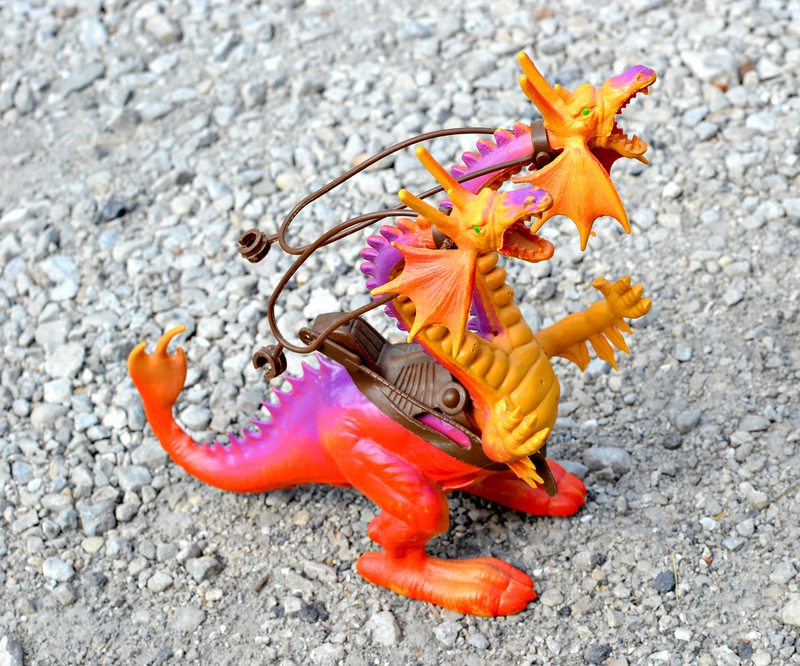 The initial series (pictured above) consisted of about five different standard bendable characters and five larger monsters in addition to the castle playset. 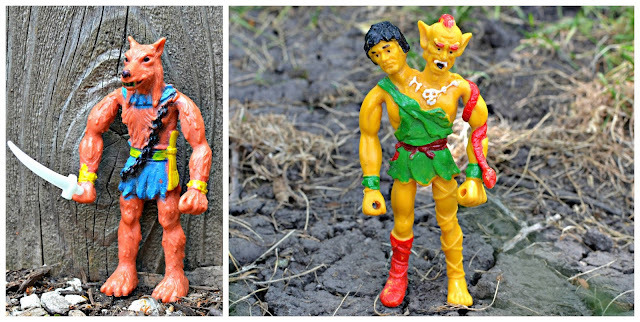 From 1983-1984 there were additional figures released--which are rarer than the Series 1 toys today--rounding out the line with about five more standard characters and four more monsters. For a comprehensive list and photos, check out the Other World section of the Action Figure Archive. Having two older brothers who were prime age to want these sort of toys when they came out, I remember a bunch of them around the house in the late '80s and early '90s (which I kind of stole for myself and still have...I doubt they miss them). At that time I desperately wanted more (especially the Froggacuda, which I only knew from the artwork on the packaging), but they were already off store shelves for a few years by then. Needless to say, as soon as the Internet became a household thing and I was old enough to buy stuff on it, I started to seek more of these badboys out! RAIDY, KREENA and RONIN are the three main heroic characters of The Other World. 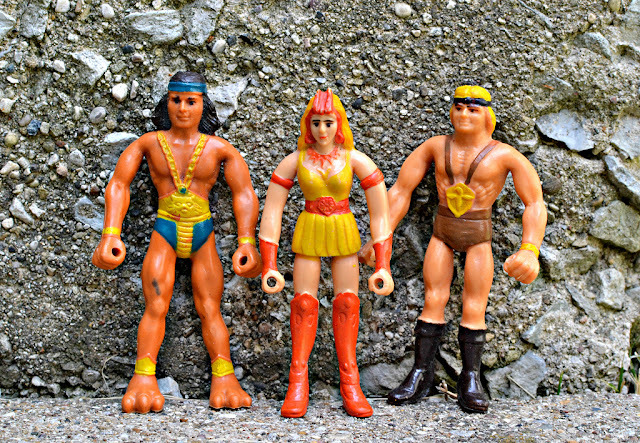 Blonde barbarian Ronin ("The Hero") fills the He-Man role, Kreena ("The Princess") can be likened to warrior goddess supreme Teela, and Raidy, well...he's a dude with bear feet. But Raidy is also "King of the Jipps," so I guess having bear feet doesn't hold you back from positions of power on Glowgon. In any line of bendies the human-type characters are naturally going to look a bit awkward, so characters like these are no doubt the lesser-desired pieces from the line. But we do need them to fight the guys below. ZENDO (red guy) and HONDU (green guy) are the two main baddies of the line, spreading terror across all of Glowgon. Zendo is "Evil King of the Mogs" while Hondu is "The Hatchetman," Zendo's right-hand (four-handed) man. They don't look all that evil or intimidating, but then again, there's only so evil a bendy can get. If you ask me, Hondu is actually the cooler figure of the two, but I guess the sidekicks often are. Here are the JIPPS and MOGS, good and bad minions. Well, the good warriors are probably too nice to call the Jipps their minions, but let's face it--they're minions. Their purpose is pretty much to jump in front of Ronin, Raidy and Kreena when the bad guys come charging, just as the Mogs serve to protect Zendo and his horde. These came packaged with the main figures as companion figures, so the more characters you got, the bigger Jipp/Mog armies you'd build. I think I prefer the Mogs because they look creepier and more detailed. Every '80s fantasy land needs at least one dragon. If it's two-headed, even better! GAIFAND here operates on the side of good, serving as trusty monster steed to Ronin. With two heads, he can burn two of those pesky Mogs to a crisp at once! Well, assuming he's a dragon of the fire-breathing variety. His arms and heads/necks are bendable, while the rest of him is made of solid, harder plastic. He comes with brown plastic reins and a saddle that are removable (they break really easily, so the removing thing is probably often not by choice). 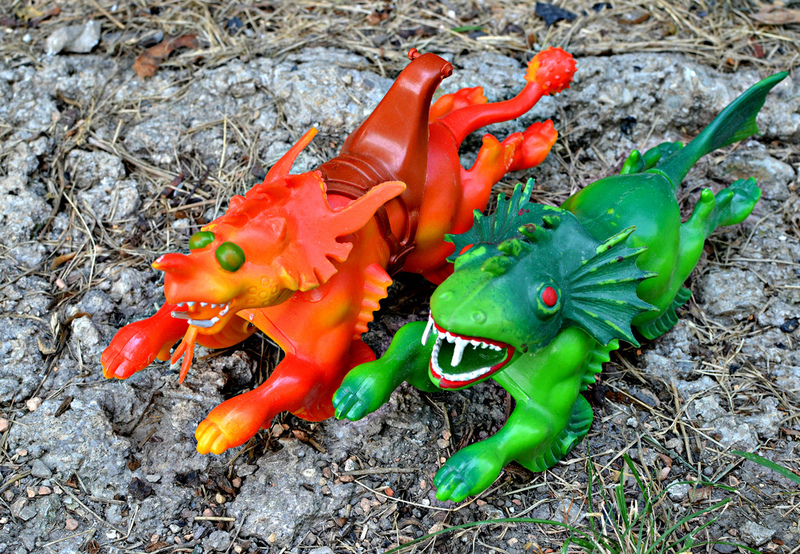 Orange beast KAMARO is "Roaring Guardian of the Jipps" while green beast SHARKOSS is "Daring Demon of the Deep" and serves as a steed for Zendo, as shown in the mini comic. These were marketed as "motorized," since you could pull them back and release to see them zip forward. I guess that was a big deal in 1982. I've always wondered how Kamaro got his name. My guess is someone with naming duties at Arco had a Camaro and thought, "Well, why the hell not?" In any case, these guys are pretty cool monsters, with rubber heads and tails, firmer plastic bodies and removable saddles. Here we have one of my favorite toys ever, the FROGGACUDA--"Monster of the Red Lake"! This amphibious monstrosity is the one I wanted the most as a kid every time I would look at the packaging artwork from my brothers' Other World toys. I finally got one off eBay many years later, and it's one of my most prized toys. It pretty much encompasses everything I love about '80s fantasy toys. I could be wrong, but I don't think the Froggacuda has any particular alignment in the Other World story--he just enjoys killing and eating everything he encounters! At least that's how I like to imagine it. 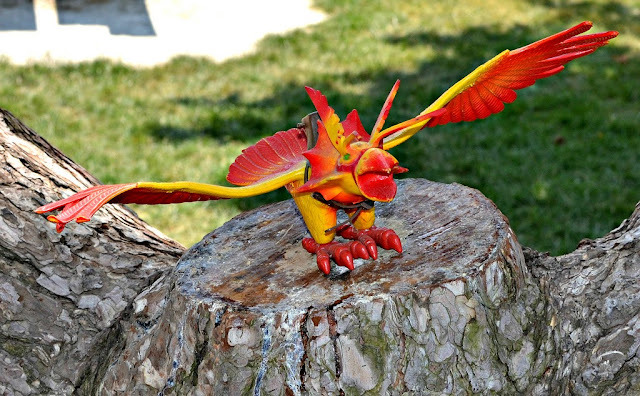 KONTORY is the line's bird monster, dubbed "Flying Beast of Prey" on packaging. As with a dragon, every fantasy toy line could use a proper flying beast. Kontory fills that role nicely with long, bendable wings and a saddle that holds the standard bendy figures, so you can use him as a vehicle for Ronin or other heroic characters to make a narrow escape during battle or swoop down and pick up Mogs to drop on Zendo from above. WEAPONS MASTER and SKITZO are a couple of the later figures in the line, from Series 2. The former is an anthropomorphic wolf/dog character that apparently guards and/or dispenses a bigass pile of weapons (I believe he came packaged with a weapon rack), and with a name like Skitzo, the two-headed yellow dude is here to remind us that the world was a lot less PC in the '80s (surely people with Schizophrenia enjoy being likened to two-headed monsters, right?). Seriously though, these are a couple of my favorite figures from the line and perfect examples of why I wish The Other World would have continued for even more series. LAVA MAN is kind of like series 2's Froggacuda, in that he is a bendable monster that's somewhat larger than the basic bendable figures, but smaller than the other monsters from the line. Another way he's similar to Froggacuda is that he's freakin' awesome. 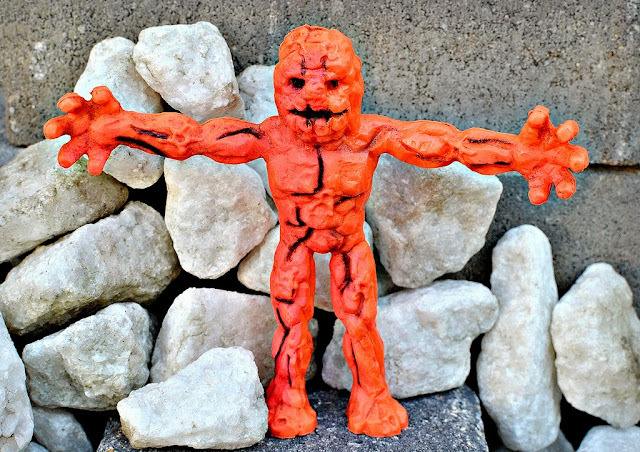 Although kind of simple, the sculpt has a lot of appeal to it, added to greatly by the vibrant neon-orangey red color of his material. Plus, you've just got to love the idea of a monster made out of lava. This guy came packaged with some plastic glow-in-the-dark boulders to toss around, which sadly I'm missing. Finally, we have SIR'COBRA, "The Strangler." Yet another in the canon of awesome monsters released in The Other World, this guy is a really long snake, complete with forked tongue. He also has legs and feet. Talons, to be exact. I love how he looks so gleeful, as if saying "I'm a big snake monster and I'm going to kiiiiiill yoooooou!". Without having him in front of me to measure, I'd say he's at least 14" long and fully bendable, which probably makes him the tallest piece in the line. Sir'Cobra was also one of the later released figures, a monster from Series 2. So there you have it, a true classic in my book when it comes to '80s toy lines, even if one the majority of collectors probably don't remember or care too much about. What do you think about Arco's Other World? Do you have any memories of this line? 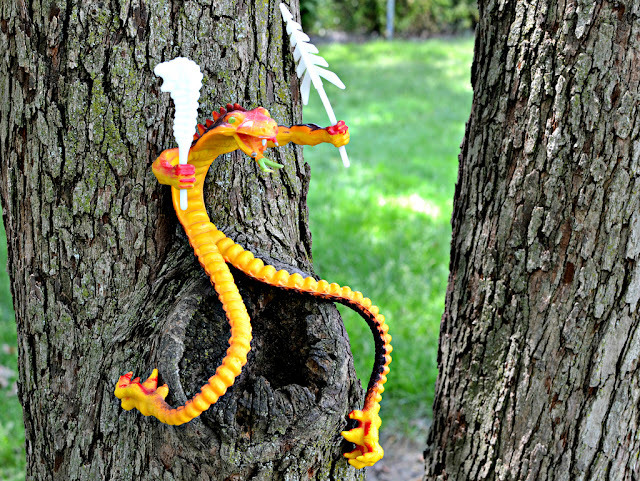 As far as bendy toys go, how do they hold up? As a kid, I hated bendy toys because their wires always ended up poking out! I've had a few with the wires popping out but plenty in good condition too. I think they hold up okay unless they're really heavily played with. It's weird/frustrating how these are usually more expensive than MOTU stuff on eBay these days... Used to have that castle as well! Just got Hondu now and nothing else, would love a Froggacuda, Sir'Cobra and a Skitzo. Fairly sure I used to have Kontory too. Bah. Yeah, they can get pretty pricey! Especially the later figures. I didn't think there was a huge collector base for them, but maybe it's just because they're not as common as MOTU stuff. One figure I want from TOW that I've never been able to get is the Lava Man. I think the only extra I have currently is a Zendo. Loved this line as a kid, right up there with MOTU, powerlords and the TSR d&d figures. I have a few, I found a Gaifand (with saddles/reins) at the market about a year ago for $4. :) I hated how kontory's feet always snapped off (at least for me they did) I swear I glues them back a hundred times... And froggacuda was always my favourite too! Great review btw. Now that you mention it, I think I remember gluing my Kontory's feet back on at some point too, haha. I have most of them as extras that I'm planning to sell. I just recently bought a castle Zendo on eBay which was apparently in 'good condition'. In fact it had no mat, a bunch of broken bits and one of the ladders was snapped clear in half. It still ended up costing me about $50. I've seen them go for 3 times that. Yeah, that thing always seems to go for a lot. My brothers had one in the '80s that I wish was kept complete. Unfortunately I think all that remains today are bits and pieces of it. I am always looking for Other World stuff I don't have, specifically a Lava Man. You always come up with the most obscure and interesting lines to review. Love that Froggacuda figure! Thanks for the comment! Froggacuda's a classic. At least to me, haha. I totally lucked out recently and found a Froggacuda figure mixed in with some other awesome 80's toys in a $1 grab bag at my local Deseret Industries Thrift Store!!! I didn't know what he was at first, but I knew he was special when I first laid eyes on him. It's no wonder you use him as your avatar! Thanks to your blog I now know his story. 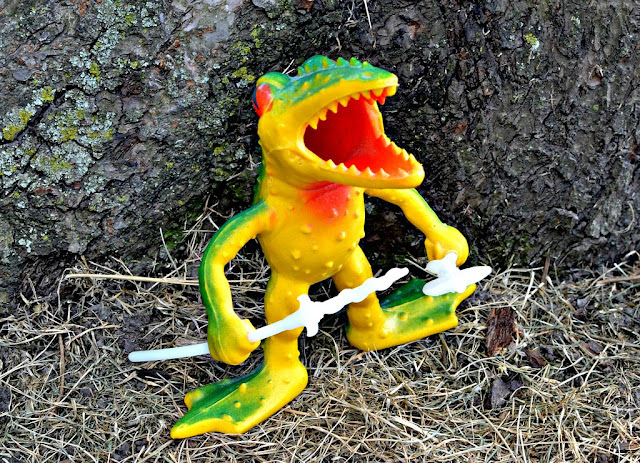 I'm going to feature Froggacuda on my blog along with 2 Outer Terrestrial Creatures and a few other cool 80's toys. I will provide a link to this post, such a great review! I love obscure toy lines like this, so awesome! Now I just need to track down Froggacuda's weapons. Not an easy task I wager. NIce score! I wish I'd find some Other World stuff out in the wild. I'll look forward to reading your post. Thanks for your comment! Finally got hold of a Lava Man, and added him to this post! My younger brother and I had a few of these (only the smaller figures from the first range) but I enjoyed looking at the catalogues and the toys in the shops and wondering what the greater story was coz it seemed like a tantalizing if rather oddball world. The fact they were crappy was coz there was no aesthetic problem with mixing them with other random crappy toys like plastic dinosaurs. The greater number of enemies seemed odd to me - I have always had a thing for even sides and felt some of the villains could have been heroes (like the carnivour centaur thing). But on the other hand maybe it is better to have more enemies to fight, in which case this toy range has one up on Transformers with its excess of Autobots. I'd love to find some of the old catalogs that included Other World stuff! Thanks for the trip down memory lane. I was seven years old when these came out and just the right age to fully enjoy playing with them. Between my friends and I,we had pretty much the entire collection. I used to have the wasp which was ridden by Skitzo. I can faintly remember that some of the larger beasts smelled like bubble gum or candy (or is that in my imagination?). As a kid I had always just assumed that The Other World was some awesome movie that I had missed or something. I also always thought that Masters of the Universe was a kind of rip-off of TOW. I can't help but see some resemblance between Ronin and He-Man. Thanks for your comment--it's always great to read other peoples' memories about these. I don't remember any of mine smelling like candy, but they did (and still do) have a strong, distinct, sort of chemically rubber/plastic smell. I always assumed that TOW was a ripoff of MOTU, but it appears they both debuted in 1982 so it's tough to say. I used to have all these Other World toys all as a kid. I might even still have them actually haha. What I still wonder about is if there ever was a cartoon about this series. I'm from The Netherlands and I CLEARLY remember as a kid one day I was zapping on TV and on an English channel I saw a kartoon featuring Hondu. Although this is almost 30 years ago I'm 100% positive it was him. The cartoon was at its end and I only got to see one minute of it. Never ever saw it again. Can anybody confirm if a cartoon was made about Other World? That's really interesting. I've never heard of an Other World cartoon being produced, but you never know. Definitely Not. The Other World was never produced into an animated series, film, or special. Such a generic looking guy like that you are probably just remebering a scene from MOTU, Blackstar, or maybe even Thundarr. I remember seeing somewhere that someone speculated that Zendo is a rip-off from a movie or cartoon. Can't remember exactly what. i have some of the figures to this day. my mom got it for me in the 80s. i was maybe 7. i will be 36 in november. Great review! I still have most of my action figures. This review makes me want to take em all out of the box their in! Thanks--glad you liked the post! Froggacuda was a race of monsters, a comic strip on the Battle for the Pir Ankus set shows a group of them. I didn't recall that from when I was a kid (i didn't own the set). Kontory was a villain mount, I stuck to that. I had most the line, but not Mock, the weapons master and rack or Castle Zendo. Awesome post! I got a bunch of these for Christmas one year. I got the series 1 heroes, Skitzo, Gaifand, Kontory, and Antor. I'm thinking it must have been a closeout deal, because they were all given to me at the same time. Of course, I lost the mini comics and the packaging as soon as I opened them, so I didn't have the slightest idea what they were. I wish I had appreciated them more, since they're still one of the coolest bendy figure lines produced. Thanks! I love reading other peoples' memories of these figures. Anyone have an idea how much a Froggacuda still in the box would be. I'm holding one that's in pretty good condition for as old as it is. I bought one a LONG time ago (like 15 years ago) and paid about $50. I have no idea if that's still an accurate price all these years later, but it's the only thing I have to go by. I absolutely loved these toys when I was a little kid. I remember being so pissed at my mom for giving/throwing most of them away years later. Really? Even lava man mom, LAVA MAN??? Kept the few remaining figures well hidden from her evil clutches. And now after 30 years they've turned up again while cleaning out the garage. Now nostalgia has kicked in and I've decided to try and collect the full series again. It was slim pickings at first but recently I've managed to collect quite a few of them. But still no lava man though..............thanks mom. Oh man, I feel for you. That's criminal to toss out a Lava Man--one of the rarest in the line! more or less same story here, but my father knew about my mother's typical mom's attitude :D, so he kept ALL my toys in the cellar, but decades later it seems that somehow half of them was lost or got stolen (we know that the cellar door was left open for a year while waiting for a proper padlock I think, but what thief would ever steal half of my toys? the other possibility is that being in bags they were confused with some other items and thrown away when the cellar was cleared and cleaned). Two years ago I decided to fix/repair/clean/organize/sell/keep them and when my hearth broke because half were missing, I slowly tried - and still trying - to buy back the missing ones and the ones I wanted but I never got, a fantastic new passion :) ...also because even if I don't actually play with them, I realized that the "aestethic attraction" is still exactely the same of 30 years ago, I just love those shapes and colors (overall the style loved by littleweirdos) as much as when I was a kid, isn't that great?! Another awesome thing: 30 years spent in a cellar, hot summers and damn cold wnters, himidty and pollution, they were covered with blackish oil that today we probably breath: pollution. And yet, after some proper cleaning and silicon spray, they look like new!!! In what other hobby you can neglect things that much without consequencies? Glad to hear at least some of them survived the years--and that they cleaned up as good as new. Thanks for your comment! These toys bring back such memories. I loved the two headed dragon and I did a search for it after looking at pictures of my Naverone playset I found online. Simpler times. I still have most of my Other World action figures. I've had them for well over 30 years now. I even have a "Ronin" figure I made a leather outfit for. I am an '80's kid, and collected some of the "Other World" toys back in the day. Even as a kid, I didn't really like the "Bend-em" aspect to the figures themselves, but did find the dragons and other creatures fairly cool. I couldn't afford to get all of them at the time, but if they were ever re-released (unlikely, I know) I'd probably get them all. I will admit that the figures themselves did look like foreign knock-offs that you would find at The Dollar Store (or someplace like that), but they were still interesting. The glow-in-the-dark weapons were cool as well. I would probably appreciate them more now than I did then - and not only for nostalgic reasons. Thanks so much for posting this! Was thinking about these toys from my childhood and found this page via google images - just typing the few words I could remember. That snake on Skitzo's arm fascinated me tremendously. I still have the Antor the wasp figure. his saddle is gone but the figure is still in excellent condition. I think I also had Moc, Yurus and Foggacuda I need to get into my boxes and see if they are still there.